The marketplaces are quiet; the streets deserted. The rumors in the taverns and the whispers in the inns all suggest the same – the evil necromancer Vorakesh is raising undead legions to help him bring back Margath, the High Lord of All Dragonkind. If the realm has ever needed heroes, this is the time! In Runebound, up to six players can adventure in a fantasy realm full of danger and peril. Travel down raging rivers, explore dark and mysterious forests, and fight all manner of heinous beasts intent on stopping you from your goal – destroying the great dragon Margath before he destroys the land! Runebound Second Edition, the new standard in adventure board games, is all you liked about the original best-selling game and more. A complete revision of the original, Runebound Second Edition has an updated game board, revised rules, new and more challenging monsters, and twelve plastic figures to represent the stalwart heroes of the realm. This epic game of high fantasy is now better than ever! This game is also a lot of fun. I love how they merged the RP element in with a board game. That’s not easy to do and still keep it moderately casual. The various characters are all fun. (Save Ronan the Wild). Kill the high dragon or enough of his spawn. Weapons and allies are interesting and well balancing. Events can be good, bad, neutral. Has good RP essence/elements while still being somewhat casual. Tiered difficulty with levels is handled masterfully. I could easily see an Inn event stack to complement to market step. Overall, a fun game and def. one of my favorites. 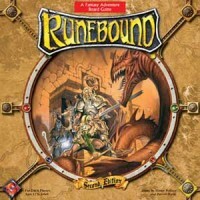 Add a Review for "Runebound: Second Edition"